Wish Doris a Happy Birthday! Doris and Les "Those Were the Good Old Days"
America's sweetheart of the 1950s and 1960s returns with an essential collection. This entire website is copyrighted by www.dorisdaymagic.com. Certain rights reserved. All music fully licensed through Spotify, Radionomy, ASCAP, BMI and SESAC. 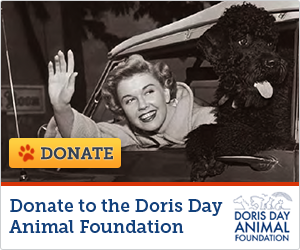 Support the Doris Day Animal Foundation when you search the Web or shop online with Goodsearch.